After seven long years of "Eelam War Three," year 2002 dawned in Sri Lanka on a historic note. Guns went silent in the battlefields as the security forces and Tiger guerrillas continued to observe a truce which came into effect from midnight December 24, or Christmas eve. In terms of nomenclature, even if it was referred to as "cessation of hostilities," the commencement of talks between the United National Front (UNF) Government and the Liberation Tigers of Tamil Eelam (LTTE), in the coming weeks and months will see this transform into a formal cease-fire. The UNF Government does not want to take any chances or send any wrong signal to the LTTE in the interim period. That has been made very clear to those concerned. • "Status quo with regard to ground deployment will remain. • Security forces and Police will not launch offensive operations. This includes firing of direct and indirect weapons. • However, security forces and the Police have the right to defend the Forward Defensive Zones up to a distance of 500 metres from the Forward Defensive Line/bunker line by employing observation posts, listening posts, patrols, ambushes, obstacle belts etc. The status quo should be maintained by both parties in the area between the bunker lines. Should any activity be conducted by the LTTE disturbing the status quo, such action should immediately be reported to the respective Service Commanders/IGP and this HQ (the JOH) also be informed accordingly. • Security forces and Police will continue to carry out operations in the cleared areas as done previously. • The Air Force will refrain from aerial bombar-dment of ground targets. • Naval operations conducted at sea with a view to prevent the import of arms, ammunition or other military equipment by the LTTE will continue and the Air Force will support the Navy in the event of a confrontation without any restrictions. • Should any situation arise, which the parties may consider to be a violation of the declaration of the cessation of hostilities, otherwise than by the use of force, the parties will endeavour to resolve such a situation. • Any violation of cessation of hostilities in any form or nature must be immediately brought to the notice of the Service Commanders/IGP and this HQ (JOH) also informed accordingly." Confrontations between the security forces and the Tiger guerrillas have come to a halt with the cessation of hostilities. But, that is not to say the war is over. Raging internecine wars have intensified in the Army, Navy, Air Force and Police causing not only factionalism but low morale and instability. Fuelling this situation almost every day is the lack of any visible action by the United National Front leadership, in the past four weeks, not only to arrest the disturbing trends but also the dangers it poses to national security. Whilst the three services have been the mainstay in the battle against Tiger guerrillas and for the enforcement of the Government's writ in "controlled" areas, the Police form the bulwark of the law and order machinery. Nowhere is the phenomenon felt more acutely than in the Sri Lanka Army, the largest security establishment in the country. Army Commander, Lt. Gen. Balagalle, who offered jobs for his soldiers with United Nations troops during PA's election campaign, received a strong rebuff from President Kumaratunga, for trying to get rid of his number two, Chief of Staff, Maj. Gen. Neil Dias. This was by using the very Regulations which the President promulgated to keep Lt. Gen. Balagalle in office when he was to retire at 55 years (on June 14, 2001). See box story on this page. But a more shocking blow came when Police conducted a raid last Wednesday night on a safe house at Athurugiriya, operated by the Directorate of Military Intelligence, to conduct counter terrorist operations. Assisting in the raid were men from the Army's Military Police (or CCMP –Corps Ceylon Military Police, as they are commonly referred to). That the Army leadership, pre-occupied with their own problems, was unable to prevent a serious breach of national security when this happened, could not avoid a dangerous situation developing and allowed the LTTE to get to know state secrets, to say the least, is most damning. The greatest irony of all this is the fact that an officer and five men are now detained under the Prevention of Terrorism Act and are being interrogated by a Police team led by SP Kulasiri Udugampola. Until last night, they are all being held at a secret location in Kandy. All of them are in one room and have to tolerate the ignominy of a stinking toilet whilst they answer questions from their interrogators. These very men were at the forefront of the fight against terrorism. The Sunday Times has learnt since the Police raid, their arrest and the resultant publicity, the LTTE has come to know details of some matters that have remained a top state secret for security reasons. This is not to fault the Police or Mr. Udugampola for carrying out the raid. An SP in the Kandy Division, Mr. Udugampola, had obtained a Court Order to conduct a raid on a house at the Millennium City at Athurugiriya. Before the raid, he had got in touch with the Army's Provost Marshal, Major General Ivan Das-sanayake, and obtained the help of Military Police officials to accompany him. Yet, Army Commander Lt. Gen. Balagalle was unaware that one of the Army's top secret operations which had brought great success and increased public confidence was going to be laid bare. Did Maj. Gen. Dassanayake inform Lt. Gen. Balagalle ? The fact that Military Police help was sought clearly indicated that the raid was on an Army establishment or one connected with it. Who are the five men now in custody of the Police under the Prevention of Terrorism Act ? They are a Captain and four regular soldiers assigned to the Directorate of Military Intelligence. The sixth is a former Tiger guerrilla cadre, who surrendered to the security forces and later enlisted as a soldier. The LTTE is now aware that these men are part of a Long Range Reconnaissance Patrol (LRRP) Group – highly trained men who infiltrated Tiger guerrilla controlled areas and carried out devastating attacks. 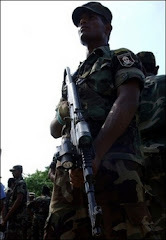 Their area of activity was the Batticaloa district and helping them to cross barriers was the Special Task Force (STF), the commando arm of the Police. The team's most prized accomplishments have been many. In the recent past it was the attack on Thambirasa Kuhasanthan alias "Nizam," the LTTE Military Intelligence Wing leader for Batticaloa. It was Nizam who was in charge of all "suicide killer" and other attacks in the City. The Captain and his men infiltrated Tiger guerrilla dominated territory on June 9 last year, and carried out the attack on Nizam. He was killed. And now, the LTTE has become privy not only to the identities of the Captain but also the five others. This has been confirmed by intelligence channels. For obvious reasons one cannot elaborate. Why did Police raid the Athurugiriya residence ? Contrary to claims that the investigations were a follow up of the killings at Udathala-winna during election vio-lence, the probe is related to an entirely different matter. It is an extension of the allegations United National Party Chairman Charitha Ratwatte and Vice Chairman Daya Pelpola made to the Army Commander on November 10, 2001. They alleged that thermo-baric explosives had been brought from the operational areas in the North to the Panaluwa Army Testing Range and that certain persons alleged to be attached to a Northern Tamil Political Party were being trained in its use. The training, they alleged, was being co-ordinated by the Directorate of Military Intelligence (DMI) together with Army instructors specially flown from the north. The UNP leaders said there may be an attempt to use these weapons on the meetings held by the UNP leadership and the Leader's campaign bus. Lt. Gen. Balagalle in a letter to Mr. Ratwatte (and copy to Mr. Pelpola) declared "there is no substance in the information" and referred their letters to the Police Chief Lucky Kodituwakku, for whatever action he deemed necessary. Mr. Kodituwakku directed a CID team to investigate the matter but they could not record any statements since those concerned were busy. The Sunday Times learns that men who were trained at Panaluwa were those engaged in the LRRP operations. They were taught the use of thermobaric weapons for use in assault on Tiger guerrilla positions. However, the Police in Kandy are learnt to have information from an informant that the Athurugiriya Safe House was linked to attempts at possible harm to Prime Minister Ranil Wickreme-singhe and to earlier claims of men being trained at Panaluwa. Police investigations are focused in this regard but The Sunday Times has learnt no tangible evidence has been uncovered so far to establish there was in fact a threat to Premier Wickremesinghe arising from the training at Panaluwa or through the Athurugiriya Safe House. Hence, Police may be compelled to release the Captain and the five men if they cannot establish there was a plot of any kind. But some Police officials talk of attempts to indict the men for the possession of a cache of weapons though Military Intelligence officials insist there is official documentation for every item – the acquisition of the Safe House as well as every weapon found. When Mr. Udugampola raided the Athurugiriya Safe House, in the company of the Military Police and men from the Athurugiriya Police, among the items found were: ten anti-personnel mines, 20 land mines, four Light Anti-Tank Weapons (LAW), one pair of goggles, two T-56 rifles, 12 magazines, 418 rounds of ammunition, one AK 47 rifle, 66 Tiger guerrilla uniforms, seven (ten kilogramme) claymore mines, one (eight kilogramme) claymore mine, 17 exploders, nine (50 metre) wire rolls, eight (100 metre wire rolls), one cyanide capsule, three antennas, three remote control devices, three detonators and thermobaric weapons. The discovery was to create more confusion. Learning of the raid, Lt. Gen. Balagalle telephoned Police Chief Lucky Kodituwakku to plead with him to sort out the matter. Director General of Military Intelligence (DGMI) Brigadier Kapila Hendavithana was rushed by him to Athurugiriya. When the DGMI spoke on the phone to Mr. Kodituwakku from the scene to say he could account for all the finds, the latter had wanted to speak to Mr. Udugampola. That conversation was to take a bad turn. Mr. Udugampola was to later telephone Interior Minister John Amaratunga, to complain of pressures on him. Interior Ministry officials were to soon assume that Police were trying to suppress matters relating to the raid. The media was tipped off and there was wide publicity. Minister Amaratu-nga despatched his relative and now a senior official, Lal Ratnayake, a former DIG, to Athurugiriya to make sure nothing was done to suppress matters. The Captain and the five men were bundled up and driven first to Military Police Headquarters in Narahenpita and then to Kandy where Detention Orders were served on them under the PTA. Their statements are now being recorded. They were taken to some places in Katugastota yesterday and no visitors were allowed to see them. Internal Army investigations have raised some intriguing questions. It was only on December 15 last year, the Athurugiriya Safe House had been obtained on rent by the Directorate of Military Intelligence for a period of six months. It has been standard practice for DMI to operate Safe Houses for secret operations. Some months ago, one in fact functioned in close proximity to the Kotte-Sri Jayawardhanapura Parliamentary complex. The address of the house was such a closely guarded secret that only one or two DMI officials knew it. Yet, the Court Order Mr. Udugampola obtained contai-ned the exact address of the house. Did a rival group within DMI surreptitiously obtain the address from an official in question and leak it ? Did a close relative of a senior police official involved in the investigations, now attached to the Military Police, play a role in obtaining the address and facilitate the raid? Inquiries have not only raised this aspect but many other sensitive matters which show that a group within the DMI has been working against the leadership. They have now been identified and disciplinary action is to follow. The last LRRP operation from the Safe House at Athurugirya had been prematurely concluded on December 21. This was after it became difficult to execute a "highly classified" and sensitive operation when it became clear there would be a cessation of hostilities. The men who came back to the Safe House had later returned some equipment including a Global Positioning System and encrypted communication sets to a camp in Kohuwala. The balance equipment was to be returned to a camp in Kosgama when the raid took place. DMI officials are now ready with documentation relating to weapons and other equipment. Whatever the outcome of the Police investigation, the identities of some brave men who have risked their lives to attack the guerrillas is now public. So are their operations. All because of the callous inaction on the part of some of those responsible. All is not well in the Sri Lanka Navy too. The leadership has been the subject of strong criticism for their inability to stall Tiger guerrillas from inducting weapons supplies through the north eastern seas. The Government last week ordered a full inquiry after The Sunday Island revealed that a large haul of weapons had been smuggled by the LTTE and the Navy had failed to intercept it. Chairing a meeting of principal Staff Officers and Area Commanders at Navy Headquarters last Thursday, Navy Commander Vice Admiral Daya Sandagiri devoted considerable time to the media. He said he was not worried about media criticism or care about it. He said the media did not determine the destinies of people. They were born with it. He said the Government was aware of those leaking information to the media. Vice Admiral Sandagiri has been at the end of criticism after ordering a Mercedes Benz worth Rs. 8.5 million as his official car during the general election period. This is despite the Navy possessing a number of Benz vehicles. In addition, he had also ordered the conversion of a Navy Pajero jeep by installing an intercooler engine at a cost of over Rs. 600,000. This was despite the Pajero jeep being in good condition with its original engine. An action of Vice Admiral Sandagiri which is likely to pose an irritant in the upcoming peace process is his decision to construct a temple at Madagal – one of two vows he has kept, of all things at state expense, upon becoming Commander of the Navy. A small temple has been built and he is making arrangements to fly senior officers and their spouses to Jaffna for a ceremony on January 21. Two engineers sent from Colombo for the construction of the temple died in an accident in Jaffna. The second vow, a ban on the consumption of beef in the Navy, has come into effect from January 1, this year. The ban is despite objections from four of five Area Commanders of the Navy. In the Sri Lanka Air Force, both infighting and campaigns have reached a high pitch. Some of those affected by the Court of Inquiry into last July's Tiger guerrilla attack on the SLAF base and the Bandaranaike International Airport have launched a vicious campaign against its Commander, Air Marshal Jayalath Weerakkody. One of the major allegations was that he transported illegal weapons to Kandy during the election campaign. Another is that he evacuated former Deputy Defence Minister, Gen. Anuruddha Ratwatte and his family, by an Air Force helicopter after he ceased to be a minister. Both allegations are being flatly denied by senior Air Force officials. A strong campaign, these officials say, is not only creating dissension but also disciplinary problems. The infighting in the Police has become so acute that the Inspector General of Police, Lucky Kodituwakku, who had been at the centre of controversy during the election campaign and his own son, Ranmal Kodituwakku, are now at the centre of widespread allegations and a strong campaign. Mr Kodituwakku, now 61, received a year long extension of service from the PA Government and some sections of the United National Front want to see him removed. He has, however, been asked to continue to function as Police Chief by the UNF leadership. Other likely aspirants are making their own pitch for the post. An anonymous petition to the Commission to Investigate Allegations of Bribery or Corruption about the quali-fications of Mr. Koditu-wakku's son, Ranmal Koditu-wakku, is now under inves-tigation. It centres over his qualifications to be an Assistant Superintendent of Police. However, senior Police officials backing Mr. Kodituwakku say Ranmal, spent 11 years in California. He has been a product of Redlands University with qualifications in Maths and Economics. They say he was recruited after his credentials were verified from the United States Embassy in Colombo. Divisions have become so sharp at Police Headquarters with at least one senior DIG staking strong claims to the post of IGP. These developments have pre-occupied the Police hierarchy so much that the pace of normal work is not only slowing down but the malaise is spreading to the provinces too. One of the reasons often attributed for the UNF Government's inaction is a reported assurance it had given President Kumaratunga that no top level changes in the security forces or the Police would be made for three months. That is said to be the basis on which she parted with the Ministry of Defence portfolio. But, if the existing situation in the security forces and the Police are allowed to deteriorate, particularly due to no action of any sort being taken by the new Government, its priority will become peace talks on two fronts – one with the Tiger guerrillas and the other with those in the country's security establish-ment. The writing is clearly on the wall. President Chandrika Bandaranaike Kumaratunga, has rejected a recommendation by Army Commander, Lt. Gen. Lionel Balagalle, to retire his deputy, Chief of Staff, Major General Neil Dias, from December 31, last year. She has approved the extension of his tenure of office until April 12, 2002 and pointed out that the services of experienced officers like Maj. Gen. Dias should be retained. Paradoxically enough, the regulations which Lt. Gen. Balagalle, used to seek the exit of Maj. Gen. Dias, are the very same ones specifically introduced to retain him in office, when he turned 55 years on June 14, 2000, and was to retire as Chief of Staff. He had to make way for Major General Janaka Perera, who assumed that office on June 15, 2000. The tailor made regulations, promulgated by President Kumaratunga, allowed then Major General Balagalle, to hold a non-existent office of "Deputy Commander" of the Army until he was made Commander. Documents containing Maj. Gen. Dias' latest extension of service was sent by the Presidential Secretariat to the Ministry of Defence early this week. The matter is now before the United National Front's Defence Minister, Tilak Janaka Marapane. Since the UNF, as a matter of policy, does not favour extension of services of security forces officers beyond their age of retirement at 55 years, how Mr. Marapane would react next week remains to be seen. The case of Maj. Gen. Neil Dias, a soldier with considerable battlefield experience, a phenomenon acutely lacking in some colleagues of his own rank or above, has become significant for many reasons. He reached the retirement age of 55 years on April 12, 2001 and had his term extended until December 31, 2001, by a special gazette notification. He was then groomed by the previous Government as the next Army Commander and was hurriedly sent for a defence management course at the United States Post Naval Graduate School in California. The course is tailor made for those aspiring to hold command positions. When he returned in the first week of December last year, he found he had less than three weeks to serve. President Kumaratunga's move to extend his term will now allow him to remain in office until April 12 this year. That is if nothing stands in the way. Lt. Gen. Balagalle's recommendation to retire Maj. Gen. Dias on December 31, last year, comes at a time when there is a serious dearth of senior officers in the Army. Such a shortage is not only in the rank of Majors General but also in the rank of Brigadiers. As a result, some Majors General have been compelled to hold more than one appointment whilst Colonels and Lieutenant Colonels have been called upon to hold positions held by Brigadiers. The present Deputy Chief of Staff, Major General Lohan Gunawardena, also holds the post of Director-General, General Staff (DGGS). Maj. Gen. Gunawardena, also an experienced, battle hardened officer, who reached the mandatory maximum in the rank, was given an extended term upon a recommendation made by Army Commander, Lt. Gen. Balagalle. He was confirmed in the rank of Maj. Gen. on December 4, 1997 and reached the maximum in the rank in 2000. He was granted a further extension, also on the recommendation of Lt. Gen. Balagalle. He is widely regarded as the key figure running day to day operations at Army Headquarters. Major General H.B. Tibbotumunuwe, Military Secretary, is also the Quarter Master General (QMG). On December 21, Lt. Gen. Balagalle, recommended to President Kumaratunga that Maj. Gen. Dias, who was groomed to replace him, be retired from the Regular Force of the Army with effect from December 31, 2001, in terms of the gazette notification (No: 1179/21) of April 12, 2001. It was his contention that Maj. Gen. Dias' date of retirement is December 31, 2001, in terms of regulations gazetted in the notification in question. However, President Kumaratunga, has disagreed with this interpretation. She has held the view that the Gazette Extraordinary (No: 1179/21), does in fact confer powers on her to extend Maj. Gen. Dias' service until April 12, 2002. This is in accordance with the notification whose validity only expired on December 31, 2001. "3A. (1) Notwithstanding anything to the contrary contained in sub-paragraphs (a) and (b) of paragraph (1) of regulation 3 above, the President may, retain in the same rank, the service of an officer presently holding the rank of a Brigadier or Major-General, by extending the services of the officer in, or by re-appointing him in, his substantive rank, at the time of his retirement, beyond the age of fifty-five years or beyond the period stipulated in respect of such rank, as set out in the aforesaid regulation, if in the opinion of the President, it is essential in the interest of the Army so to do. (2) The services of an officer may, at the discretion of the President, be retained in terms of paragraph (1), if the officer concerned holds an unblemished record of service and good conduct for a period of ten years immediately preceding such extension or re-appointment: Provided however that services of an officer should not be retained beyond a period of twelve months from his reaching the age of fifty-five years or exceeding a period of twelve months from the date of such extension or re-appointment, whichever is later. (3) Every officer whose services have been retained in terms of this regulation shall be placed in a Supernumerary Post and such post shall be deemed to be suppressed upon such officer ceasing to function in such post". The provisions of this regulation shall continue to be in force till 31st December, 2001." Apart from Maj. Gen. Dias' case, the Ministry of Defence last year endorsed the retirement of three Brigadiers – Palitha Fernando, a former Military Spokesman (Director, Sports), Bandula Ranasinghe (Director, Movement) and P.G. Charles (Director, Welfare) from December 31, last year. Brigadier Priyantha Samaratunga (Director, Army Quartering) has also retired. The dearth of Brigadiers has led to several positions Including Brigade Commanders being held by Colonels or Lieutenant Colonels. The absence of a uniform policy with regard to those retiring or reaching the mandatory maximum service in the rank, during the tenure of the People's Alliance, caused a great deal of heartburn among the officers in the security forces. Those who had the backing of their superiors or wielded political clout were the ones who succeeded, they complained.